MoonMarble.com - Dan Neff - "UV Marble with Opal Chips"
Art Glass → Contemporary Handmade Marbles → Dan Neff - "UV Marble with Opal Chips"
Handmade marble by Dan Neff of Naf Glass. This is a wispy design with glass that glows under a uv blacklight and sparkly dichroic. Multitudes of synthetic opal chips float around in the abyss. 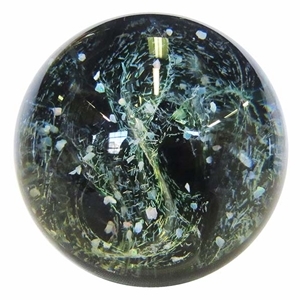 The back is black and decorated with a labyrinth like design and a blue aventurine spot on the bottom. Approximately 1 7/8"+ in diameter.